Bob Dylan (click here for Dr. Rock’s playlist) wrote “Mr. 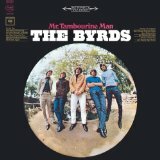 Tambourine Man” in 1964, recorded it in January 1965, and released it on Bringing It All Back Home in March 1965. The Byrds (click here) released their version as a single on April 12, 1965. It quickly shot to #1 on both the U.S. and U.K. singles charts and eventually settled at #79 on Rolling Stone magazine’s Top 500 songs of all-time. Click here for a Vintage Video of the Byrd’s lip-synching and fake-playing their way through “Mr. Tambourine Man” on the Ed Sullivan Show in 1965.